A fantastic horror serial. The classic horror style is evoked skillfully. As a fan of classic horror in the vein of Victorian Gothic, the writing is oddly comforting to me, as it evokes a sense of familiarity despite the unsettling content. My favourite podcast, no question. I am enthralled with this podcast and currently marathoning it. Make sure you listen closely and try to remember the names you hear mentioned! Statement of Manuela Dominguez, regarding her unconventional religious beliefs and their intersection with her project aboard the space station Daedalus. Original statement given July 14th 2014. Sound effects this week by JakLocke, contramundum, rachaelbuchanan, mrh4hn, and previously credited artists via freesound.org. Statement of Adelard Dekker, taken from a letter to Gertrude Robinson dated 22nd January 2006. Statement of Jared Hopworth, the Boneturner, regarding his association with Flesh and recent activities. Thanks to this week's Patrons: Zachary Pinz, Adina Adriana Ceara, Griesly, Ash Sullivan, Jenna Nolt, Erika Kvistad, Bradie Forsberg, Lorna M, Rose Marie Wong. Sound effects this week by editor_adp, kylepyke, deleted_user_877451, alienistcog, ProductionNow, smokenweewALT, draftcraft, JoelAudio, stomachache, coltures, MinigunFiend, mmaruska, jop9798, 000600, TheBuilder15, leonelmail, and previously credited artists via freesound.org. Statement of Lucia Wright., regarding just a... A hole. A hole filled with... With meat.. Original statement given December 19th, 2008. Statement of Kulbir Shakya, regarding a flood that occurred around his flat in Hackney. Original statement given September 4th, 2013. Thanks to this week's Patrons: stickyshoelaces, RJ, Sarah randlett, Iryka Smeke, Mupod, Richard Dixon, Sarah Hickey, Jess Em, Joseph Fink and Jane dataghosts. Statement of the surviving half of the being calling itself ‘Breekon and Hope’, regarding its existence. Statement... extracted from subject 3rd March 2018. Thanks to this week's Patrons: Ever Anon, Nicole Fry, Meagan Waltz, Mike Nutter, Sean Frohling. Sound effects this week by alegemaate, Yap_Audio_Production, LG, viznoman, mshahen, Suburbanwizard, Jamitch2 and previously credited artists via freesound.org. Statement of Doctor Jonathan Fanshawe, regarding the months leading to the death and autopsy of Albrecht Von Closen. Original statement given as part of a letter to Jonah Magnus, November 21st 1831. Thanks to this week's Patrons: mielebit, Devin Goodman, the tempered steel of loss, Chase Curtin, Andy Plain, Summer Brown, Carpark Grackle, Jonathan Skowronek, Erin, harrison minnix. Sound effects this week by YleArkisto, jmbphilmes, leonelmail, nettimato and previously credited artists via freesound.org. Statement of Deborah Madaki, regarding an adult art class she took in the Spring of 2004 and her friendship with ‘Gabriel’, a fellow student. Original statement given 11th October 2009. Thanks to this week's Patrons: aetherglow, Steven Newman, Shanti Pillai, Tom Harding, Fancy George Jones, Miranda Baldwin, Annie Stevens, Jonah Levin, Alice Ebenhoe, Hugh Collins. Statement of Lorell St John, regarding zombies. Original statement given 1st February 2015. Paul Clemens, Jess Osterhout, Opalineillyria, Nick Dunn, Callum Ayres, Diana Restrepo, Stuart Finlay, Ambre marshall, Danielle Carter, Dive Riley, Josh Wein. Sound effects this week by OwlStorm, Tombombadil1988 and previously credited artists via freesound.org. Statement of Oliver Banks, regarding his dreams and trying to run away. Statement given directly to Jonathan Sims, Head Archivist of the Magnus Institute, currently unresponsive. Thanks to this week's Patrons: Ben Macpherson, Ambrose Harwood, Madeleine Cella, Orethon, Amanda Blakeley, Victor Wolfe, Jay Toth, marcella mcindoe, Tina Fritzsch, Crystal Land, Dan and Melissa. Edited this week by Elizabeth Moffatt & Alexander J Newall. Sound effects this week by alienistcog, booluhui, straget, UncleSigmund, novino, albertofcasuso, nickrave & previously credited artists via freesound.org. The Magnus Archives will return January 10th 2019. Sound effects by alienistcog, booluhui, straget, UncleSigmund, novino, albertofcasuso, nickrave & previously credited artists via freesound.org. No tricks, just treats, as Jonny and Alex answer your questions about The Magnus Archives and Season 3! And we're pleased to announce that on 8th December 2018, 10am-10pm, the Rusty Quill charity livestream in aid of MIND & better mental health will be happening again, bigger & bolder than ever! Join us on Twitch, or in full 360 on YouTube, or even... IN PERSON! That's right - we'll be gaming & japing before a live audience and YOU can be there with us! Tickets & details available at https://rustyquill.ticketbud.com/rqgg18 with all proceeds being donated to MIND. Thanks to this week's Patrons: Paul Clemens, Jess Osterhout, Opaline illyria, Nick Dunn, Callum Ayres, Diana Restrepo, Stuart Finlay, ambre marshall, Danielle Carter, Dave Riley, Josh Wein. Statement of Elias Bouchard, regarding the dreams of Jonathan Sims, Head Archivist of the Magnus Institute, currently unresponsive. Details pulled directly from subject. Thanks to this week's Patrons: MissRoslyn, Jenn Kern, Mirsasee Chow, Elizabeth Richardson, Kris Eversole, Shadowspinner, Amy Carlo, Nicholas w Gropp, Ace, leCanard. Sound effects this week by Edie & previously credited artists via freesound.org. Thanks to this week's Patrons: Mr. Martin Spider, Sarah Elizabeth Solbrig, Gordon Aitken, Anjanette Schussler, Fadingleburg, Cody Watson, Elizabeth Beale. Sound effects this week by IanStarGem, bennychico11, UOregonCinemaStudies, EFlexTheSoundDesigner, JoelAudio, cliftonmcarlson, leonelmail, Slave2theLight, Werra, dheming, jjhouse4, j1987, zimbot & previously credited artists via freesound.org. Original recordings of Magnus Institute visit to the House of Wax, Great Yarmouth, and an internal management dispute. Thanks to this week's Patrons: Mia Boberg Winlöf, Rowan, Ben Vacha, Delta Tango, Katherine Weinberg, Victoria S, Elizabeth Brown, Jejune, C Belli, Rebecca Gelernter. Edited this week by Brock Winstead & Alexander J Newall. Sound effects this week by FedeFrede, daboy291, pfranzen, crazyadamos, amholma, jeffdutton10, jcdecha & previously credited artists via freesound.org. Assorted statements of Magnus Institute archival staff, prior to their departure for Great Yarmouth. Thanks to this week's Patrons: Jeannine Martell-Morris, Cathy McLeod, Lane Lloyd, Emma Crisp, Nikkee Knyte, Carly Sherba, Emily Phelps, Sheena Gerstenberger, Mika Cadiz, Miranda Waters. Sound effects this week by bdunis4, nioczkus, tmkappelt& previously credited artists via freesound.org. Statement of Mikaele Salesa, regarding an antique meat grinder in his possession during the Autumn of 1999. Original statement given January 4th 2007. Thanks to this week's Patrons: Jon-Paul Vaught, Jaylee Fox, Cody Watson, Victoria Durocher, Jordan Jackson, Martin Hill, Jay Kidwell, Charlotte Vaughan, Rebeca Vieira Barros de Oliveira, Tim Mays. Sound effects this week by Tombombadil1988 & previously credited artists via freesound.org. Statement of Anya Villette, regarding a cleaning job on Hill Top Road. Original statement given April 22nd, 2009. Thanks to this week's Patrons: Danielle Moyer, Stephen Oglesby, NotAnAlien, Judica, Sarah “Nice Skin You Got There” Clary, Evan Thorne, Rebecca Swaine, Jace Rose, Atara, Chantay Osborne. Sound effects this week by OrbitalChiller, BehanSean, kforetek & previously credited artists via freesound.org. Statement of Adelard Dekker, regarding the near death and subsequent activities of Justin Gough. Statement undated, likely circa 2012. Thanks to this week's Patrons: Jessica Huang, Roxanne Rasco, Nightmare Consortium, Cecile Kiil Kirkdale, Hale, William Peregrine. Sound effects this week by Abro, FractalStudios, PMBrowne, Timmeh515, jeffdutton10, Fugeni, Reitanna, rodincoil, Spooky modem, Podsburg, dr maysta & previously credited artists via freesound.org. Statement of Lisa Carmel, regarding her involvement in a series of murders. Statement number 0111311, 13th November 2011. Thanks to this week's Patrons: Phil Catterall, Seb Wake, Graham Knight, Bradley Renshaw, Cailyn Toomey, Hilary Merline, Ben Plopper, Crowbi, Calacatia, Plunder Duck, Robbie Lyons. Sound effects this week by engreitz & previously credited artists via freesound.org. Statement of Gerard Keay, deceased, regarding the death of his mother, Mary Keay. Statement taken posthumously from subject, June 30th 2017. Thanks to this week's Patrons: Amanda Gracia, Scott Shin, Chainsaw Hunter, Rodda Prime, Morgan Fitzmorris, Alex Weltlinger, Jeanette Åstrand, sAZAndorable, Erica Greitzer, Jay Iannuzzelli. Sound effects this week by Pfannkuchn, SunnySideSound, qubodup, lordvanye, CGEffex, ralphwhitehead, JakLocke, SpliceSound & previously credited artists via freesound.org. Martin Blackwood, Archival Assistant at the Magnus Institute, recording statement number 0121403, statement of Alexia Crawley, given March 14th 2012. Statement of Julia Montauk, regarding her initial encounters with the hunter Trevor Herbert. Statement taken direct from subject, June 29th 2017. Sound effects this week by UOregonCinemaStudies, Straget, lasdimot, MWLAND, and previously credited artists via freesound.org. Statement of Adonis Biros, regarding his performance on stage. Original statement given August 20th 2009. Statement of Howard Ewing, regarding his interview with an unidentified member of British Transport Police. Original statement given February 1st 2010. Sound effects this week by im.kahn Denver, bajko, rempen, moviebuffgavin, klangfabrik, mitchellsounds, conleec, daphne-in-wonderland, bone666138, Kinoton, Chippy569, michorvath, JohnDelayniKIng, J.Zazvurek, EFlexTheSoundDesigner, Caitlin_100, and previously credited artists via freesound.org. Jan Kilbride’s account of his time spent aboard the space station Daedalus. Statement date February 10th 2008. Statement of Second Lieutenant Charles Fleming, regarding his experiences during the Taiping Rebellion. Original statement undated, but apparently written in early 1862. Sound effects for this episode provided by Taira Komori & mmiron. Statement of François Deschamps, regarding the family and presumed marriage of Benoît Maçon. Statement given June 4th 2014. Edited by Brock Winstead & Alexander J Newall. Sound effects for this episode provided by qubodup, 14FPanskaKremenakova_Marie & previously credited artists via freesound.org. Statement of Michael, taken from subject. Date unknown. Sound effects for this episode provided by mshahen, Sir Smith, Fantozzi, SilentStrikeZ, cclaretc, Werra, amholma, jcdecha & previously credited artists via freesound.org. Stay tuned for a shiny new Magnus episode next week! Edited by Elizabeth Moffatt & Alexander J Newall. This week's episode is the second of two winning stories from our Rusty Fears competition, written by fans like you and produced by us here at Rusty Quill. "Paint" is written by Melissa Mason and read by Jonathan Sims. Note: this is a piece of stand-alone fiction and not a part of the Magnus canon. Our first ever competition, Rusty Fears, spawned an incredible amount of great entries. After hours of reading and deliberation in Rusty Towers, Alex, Jonny & Anil announced the winners. This week's episode is the first of TWO winning stories written by fans like you and produced by us here at Rusty Quill. Without further ado: "Lucid" is written by Elizabeth Richardson and read by Jonathan Sims. Listen in next week (and then keep listening of course) to catch the next winning story! Note: this is a stand-alone piece of fiction and not part of the Magnus canon. Join Jonny Sims outside of his role as the Archivist as he leads Alex J Newall, James Ross, Bryn Monroe and Ben Meredith through the second half of their spooky adventure in the Deadlands Campaign setting of Savage Worlds. Listen to our gang slowly fall apart as they desperately attempt to survive in a world populated by supernatural horror. Thanks to this week's Patrons: Garrett Monroe, Chris Main, John Wm. Thompson, Gavin Taylor-Black, Eliza Margaret, MJ Stokesish, Dawn A Weisenberger, Mark Young, Andrew Kopplin, Douglas Lewis. Sound effects for this episode provided by Bini_trns, Slave2theLight, jacobalcook, gneube, sandufi, Massivecarcrash and previously credited artists via freesound.org. Join Jonny Sims outside of his role as the Archivist as he leads Alex J Newall, James Ross, Bryn Monroe and Ben Meredith through a spooky adventure in the Deadlands Campaign setting of Savage Worlds. Meet our band of questionable desperadoes as they attempt a bank heist in a world populated by supernatural horror. Its a straightforward job and surely nothing could go wrong… right? Sound effects for this episode provided by Ramston, csengeri, RockSavage, Benboncan, CGEffex, cedarstudios, mlteenie, Max_Headroom, Podsburgh, StephenSaldanha, GoodListener, shadoWisp, Eneasz, soundmary, TimPryor, woodmoose, steveygos93, Craxic, vmgraw, fastson, Ned Bouhalassa, MrProfDrDickweed, CosmicEmbers, dheming and previously credited artists via freesound.org. Case 9522002 - Robert E. Geiger. Incident occurred in Boise City, Oklahoma, April 1935. Victim’s name given as Stefan Brotchen. Statement given 20th February, 1952. Committed to tape 2nd September, 2007. Gertrude Robinson Recording. Gertrude Robinson is played by Sue Sims, The Archivist is played by Jonathan Sims, Michael is played by Luke Booys, Georgie Barker is played by Sasha Sienna, Breekon is played by Martin Corcoran, Hope is played by Steve Violich. Sound effects for this episode provided by MrAuralization, CGEffex, Diramus (https://www.youtube.com/user/diramus), RICHERlandTV, LOVEBURD & previously credited artists via freesound.org. Martin Blackwood, Archival Assistant at the Magnus Institute, recording statement number 8640514, statement of Doctor Algernon Moss, given May 14th 1864. Sound effects for this episode provided by qubodup, SunnySideSound & previously credited artists via freesound.org. Statement of Jackson Ellis, regarding the geographical oddities in the town of Bucoda, Washington. Original statement given 3rd March 2009. The Archivist is played by Jonathan Sims, Nikola Orsinov is played by Jessica Law. Sound effects for this episode provided by engreitz, cgeffex, poorenglishjuggler, fillsoko, sturmankin, idalize & previously credited artists via freesound.org. Statement of Alfred Breekon, regarding a new pair of workers at his delivery company. Original statement given May 15th 1996. The Archivist is played by Jonathan Sims, Sarah Baldwin is played by Alice Adzowa, Alice "Daisy" Tonner is played by Fay Roberts. Sound effects for this episode provided by dheming, Klankbeld, HarryPeeks, acidsnowflake, LeMudCrab, Adam_N, Caitlin_100, mikewest, EFlexTheSoundDesigner & previously credited artists via freesound.org. Martin Blackwood, Archival Assistant at the Magnus Institute, recording statement number 9770211, statement of Luca Moretti, given November 2nd 1977. Sound effects for this episode provided by Australopithecusman & previously credited artists via freesound.org. Statement of Georgina Barker regarding the last words of possible corpse. Recorded direct from subject April 29th 2017. Edited by James Austin, Brock Winstead & Alexander J Newall. Sound effects for this episode provided by justiiiiin, pogmothoin & previously credited artists via freesound.org. Statement of Lester Chang regarding the cleaning habits of his father-in-law. Original statement given March 5th 1995. Sound effects for this episode provided by Reitanna, sgrowe & previously credited artists via freesound.org. Statement of Barnabas Bennett, as given in a short letter to Jonah Magnus. April 9th 1824. Sound effects for this episode provided by mefrancis13, jrssandoval, SpliceSound, theshuggie, EskimoNeil & previously credited artists via freesound.org. Statement of Micheal Crew regarding his experiences with the supernatural. passAirmangrace, DSOADigital, ceberation, spenceomatic, fryzu82, Glitchedtones, Anthousai, FunWithSound, JakLocke, MaxDemianAGL, mmasonghi, Lesmash, uEffects, taure, Slave2theLight, northern87, pfranzen & previously credited artists via freesound.org. Martin Blackwood, Archival Assistant at the Magnus Institute, recording statement number 0130807, statement of Ross Davenport, given August 7th 2013. Statement of Jude Perry, regarding... some advice. Recorded direct from subject, April 24th 2017. Sound effects for this episode provided by saturdaysoundguy & previously credited artists via freesound.org. Martin Blackwood, Archival Assistant at the Magnus Institute, recording statement number 0030411, statement of Enrique MacMillan, given November 4th 2003. Case 0141010 - Sebastian Skinner. Incident occurred in Gwydir forest, North Wales, September 2014. Statement given 10th October, 2014. Committed to tape 4th April, 2015. Sound effects for this episode provided by MrAuralization, Krisboruff and previously credited artists via freesound.org. Statement of Benjamin Hatendi... Hateendi? Regarding... A blanket. Dead friend. Monster. Regarding his unavoidable and gruesome end. How he tried to hide. He couldn't. Statement is from 1983. March 2nd. And I guess... I'm doing this one. Tim Stoker. Archival assistant... Archival prisoner at the Magnus Institute. Sound effects for this episode provided by Sagetyrtle and previously credited artists via freesound.org. Martin Blackwood, Archival Assistant at the Magnus Institute, recording statement number 9900112, statement of Adrian Weiss, given December 1st 1990. Edited by Elizabeth Moffat, Brock Winstead & Alexander J Newall. Sound effects for this episode provided by Dasgoat and previously credited artists via freesound.org. Statement of Chloe Ashburt, regarding a new window display at Fanton’s department store in Hammersmith. Original statement given 19th October 2013. Sound effects for this episode provided by Kupp 2 and previously credited artists via freesound.org. Statement of Alice "Daisy" Tonner, regarding the crimes and death of Calvin Benchley. Statement never given. Sound effects for this episode provided by Filmfan87, youandbiscuitme, soundsforhim and previously credited artists via freesound.org. Statement of Jonathan Sims, regarding a childhood encounter with a book formerly possessed by Jurgen Leitner. Statement recorded by subject, February 18th 2017. Stories from the edges of history. Historic Royal Palaces, in association with Rusty Quill, presents Outliers – a historic fiction podcast. Enjoy a selection of stories from award-winning contemporary writers as they reveal the people hiding in the shadows of real events at some of the greatest palaces ever built. Check it out on iTunes, RSS, our website or search "Outliers Rusty Quill" on you podcasting platform of choice. Join Alex, Mike, Anil, Martyn and Ben as they discuss what it takes to get an episode of The Magnus Archives from the page to your ears. Season 3 of The Magnus Archives will commence on the 23rd November 2017. Addition Music by Samuel D F Jones. #0170216-B Statement of Jurgen Leitner regarding his life and works. Recorded direct from subject 16th February 2017. If you'd like to support us, head to www.patreon.com/rustyquill Sound effects for this episode provided by BathroomCrooner, SoundsForHim, StudentTanita, hank_richard, daboy291, TheFilmLook, Slave2theLight, InspectorJ, youandbiscuitme, Alternicity, Sethroph, skradz and previously credited artists via freesound.org. Check out our merchandise at https://www.redbubble.com/people/rustyquill/collections/708982-the-magnus-archives-s1 You can subscribe to this podcast using your podcast software of choice, or by visiting www.rustyquill.com/subscribe. Please rate and review on your software of choice, it really helps us to spread the podcast to new listeners, so share the fear. #0170216-A Original recording of manifestations and sightings at the Magnus Institute, London, 16th February 2017. If you'd like to support us, head to www.patreon.com/rustyquill Sound effects for this episode provided by Stubb, saturdaysoundguy, apolloaiello, wolfey1923, cornwallis89, thalamus-lab, bareform, kd-jack, jorickhoofd, splicesound, adam-n, editor-adp, dnab55 and previously credited artists via freesound.org. Check out our merchandise at https://www.redbubble.com/people/rustyquill/collections/708982-the-magnus-archives-s1 You can subscribe to this podcast using your podcast software of choice, or by visiting www.rustyquill.com/subscribe. Please rate and review on your software of choice, it really helps us to spread the podcast to new listeners, so share the fear. #0011206 Statement of Lawrence Moore, regarding something that was not his cousin. Original statement given June 12th 2001. Thanks to this week's Patrons: Lacey Rough, Julia Morgan, Nope, Liss Kuhlman, Franchesca Todd, Elena Mychaleckj, Matt Weir, jst1138 and Kristen Bonner If you'd like to support us, head to www.patreon.com/rustyquill Sound effects for this episode provided by magedu, sagetyrtle, sandufi, Islabonita, cmusounddesign, kevinkace, corkscr3w, vacuumfan7072, Yoyodaman234, n_audioman, saturdaysoundguy and previously credited artists via freesound.org. Check out our merchandise at https://www.redbubble.com/people/rustyquill/collections/708982-the-magnus-archives-s1 You can subscribe to this podcast using your podcast software of choice, or by visiting www.rustyquill.com/subscribe. Please rate and review on your software of choice, it really helps us to spread the podcast to new listeners, so share the fear. #9941509 Statement of Lucy Cooper. Incident occurred in Draycott, Somerset, August 1994. Victim’s name given as Rose Cooper. Statement given 15th September, 1994. Committed to tape 4th November, 1996. Gertrude Robinson Recording. Thanks to this week's Patrons: Joshua Fillon, Linzi H. Amy Stapleton, Max Cairnduff, Rosie Delight, Kristen Ahlstrom, Anika Kahn, Adam Bertolett, Linda Julia, Sean Frohling If you'd like to support us, head to www.patreon.com/rustyquill If you'd like to come to our live show with Chaotic Adequate in London on 17th August, tickets can be bought here: http://www.wegottickets.com/event/411950 Sound effects for this episode provided by previously credited artists via freesound.org. Check out our merchandise at https://www.redbubble.com/people/rustyquill/collections/708982-the-magnus-archives-s1 You can subscribe to this podcast using your podcast software of choice, or by visiting www.rustyquill.com/subscribe. Please rate and review on iTunes, it really helps us to spread the podcast to new listeners, so share the fear. #0171302 Statement of Melanie King, regarding her further researches into... war ghosts. Recorded direct from subject 13th February 2017. Thanks to this week's Patrons: Will Coleda, Laura Eberly, Jon Bettin, Alicia Ochsner, Brad Bone, Alan Sharpe, Vivianann, Loren Davis, Shelly Darrington, Macy Grant If you'd like to support us, head to www.patreon.com/rustyquill Sound effects for this episode provided by previously credited artists via freesound.org. Check out our merchandise at https://www.redbubble.com/people/rustyquill/collections/708982-the-magnus-archives-s1 You can subscribe to this podcast using your podcast software of choice, or by visiting www.rustyquill.com/subscribe. Please rate and review on iTunes, it really helps us to spread the podcast to new listeners, so share the fear. #0060711 Statement of Stephen Walker, regarding his brother's disappearance from the top of Tour Montparnasse in October 2006. Original statement given November 7th 2006. Thanks to this week's Patrons: Angelina Orlicky, Sigurd Hrothvitnir, Surly Beast, George Sulea, Margo Axsom, Julianne Bowman, Alexander Mulhern, Samantha Paul, JCasey, Emily Jane If you'd like to support us, head to www.patreon.com/rustyquill Sound effects for this episode provided by previously credited artists via freesound.org. Check out our merchandise at https://www.redbubble.com/people/rustyquill/collections/708982-the-magnus-archives-s1 You can subscribe to this podcast using your podcast software of choice, or by visiting www.rustyquill.com/subscribe. Please rate and review on iTunes, it really helps us to spread the podcast to new listeners, so share the fear. #0150806 Statement of Lydia Halligan regarding her insomnia. Original statement given 8th June 2015. Thanks to this week's Patrons: Zach, Lawrence Allen, Bob Hundertmark, Cassandra Berry, Grant Lindley, Alexandra Spouse, Alexander Linde Nielsen, Sarah Mehra, Alexis Arendt, Martyn/I, Ben Am Very Smelly If you'd like to support us, head to www.patreon.com/rustyquill Sound effects for this episode provided by previously credited artists via freesound.org. Check out our merchandise at https://www.redbubble.com/people/rustyquill/collections/708982-the-magnus-archives-s1 You can subscribe to this podcast using your podcast software of choice, or by visiting www.rustyquill.com/subscribe. Please rate and review on iTunes, it really helps us to spread the podcast to new listeners, so share the fear. #0171102 You said it started with a kidnapping case? Thanks to this week's Patrons: Joli Furnari, Smriti Prabhat, Daniel I, Matthew Seidl, Laura, Kathleen Birley, Caroline, Brendan Reilly, Christopher Otero, Ramius If you'd like to support us, head to www.patreon.com/rustyquill Sound effects for this episode provided by previously credited artists via freesound.org. Check out our merchandise at https://www.redbubble.com/people/rustyquill/collections/708982-the-magnus-archives-s1 You can subscribe to this podcast using your podcast software of choice, or by visiting www.rustyquill.com/subscribe. Please rate and review on iTunes, it really helps us to spread the podcast to new listeners, so share the fear. #0092010 Statement of Craig Goodall, regarding his explorations of an abandoned chicken and kebab shop in Walthamstow. Original statement given 20th October 2009. Thanks to this week's Patrons: Rachel Reeves, Dakota Jahn, Izzy Peart-Mills, Patrick O'Duffy, Stefan Sipika, Geek, Jen Lucy, Lex Hunter, M J Lacey, Liz Luu If you'd like to support us, head to www.patreon.com/rustyquill Sound effects for this episode provided by Maurice_J_K, kyliank, Gorky173 and previously credited artists via freesound.org. Check out our merchandise at https://www.redbubble.com/people/rustyquill/collections/708982-the-magnus-archives-s1 You can subscribe to this podcast using your podcast software of choice, or by visiting www.rustyquill.com/subscribe. Please rate and review on iTunes, it really helps us to spread the podcast to new listeners, so share the fear. #0172501 Statement of Karolina Górka, regarding a brief period trapped on the London Underground. Statement taken direct from subject 25th January 2017. If you'd like to support us, head to www.patreon.com/rustyquill Sound effects for this episode provided by previously credited artists via freesound.org. Check out our merchandise at https://www.redbubble.com/people/rustyquill/collections/708982-the-magnus-archives-s1 You can subscribe to this podcast using your podcast software of choice, or by visiting www.rustyquill.com/subscribe. Please rate and review on iTunes, it really helps us to spread the podcast to new listeners, so share the fear! #0030912 Statement of Masato Murray, regarding an unusual inheritance and the causes thereof. Original Statement given 9th December 2003. If you'd like to support us, head to www.patreon.com/rustyquill Sound effects for this episode provided by previously credited artists via freesound.org. Check out our merchandise at https://www.redbubble.com/people/rustyquill/collections/708982-the-magnus-archives-s1 You can subscribe to this podcast using your podcast software of choice, or by visiting www.rustyquill.com/subscribe. Please rate and review on iTunes, it really helps us to spread the podcast to new listeners, so share the fear! #0101811 Statement of Darren Harlow, regarding a failed psychology experiment at the University of Surrey. Original statement given 18th November 2010. Thanks to this week's Patrons: Ross Barlow, Simon Doderer, Heather MacKenzie, Callum Thomas, Amy Barber, Scott Morrison, Rain, Elliott W James, Charles Allen Marable, Kirsty Conrad If you'd also like to support us, head to www.patreon.com/rustyquill Sound effects for this episode provided by Jamitch2, lawnjelly, meggiepie and previously credited artists via freesound.org. Check out our merchandise at https://www.redbubble.com/people/rustyquill/collections/708982-the-magnus-archives-s1 You can subscribe to this podcast using your podcast software of choice, or by visiting www.rustyquill.com/subscribe. Please rate and review on iTunes, it really helps us to spread the podcast to new listeners, so share the fear! #0030306 Statement of Joseph Russo regarding a book allegedly authored by Sir Frederick Treeves. Original statement given June 3rd 2003. Thanks to this week's Patrons: Paul Sims, Janelle Gobin, Rachel Lewis, Josh Zurcher, Luke Adams, Bobthezool,. Maia Barrow, Robert 'Check out my freaky table' Rulison, Ashlie McConkie, David Pridmore If you'd also like to support us, head to www.patreon.com/rustyquill Sound effects for this episode provided by beerbelly38 and previously credited artists via freesound.org. Check out our merchandise at https://www.redbubble.com/people/rustyquill/collections/708982-the-magnus-archives-s1 You can subscribe to this podcast using your podcast software of choice, or by visiting www.rustyquill.com/subscribe. Please rate and review on iTunes, it really helps us to spread the podcast to new listeners, so share the fear! #0071803 Statement of Jack Barnabas regarding a short-lived courtship with Agnes Montague in the Autumn of 2006. Original statement given March 18th 2007. Thanks to this week's Patrons: Martin Orchard, Cheryl Peterson, Kristen Bonner, Zack Clark, Marc Elliott, Anna O'Rourke, Erin Dombrowski, Jay Fernandez, Matt Landau, David Minch-Dixon. If you'd also like to support us, head to www.patreon.com/rustyquill Sound effects for this episode provided by previously credited artists via freesound.org. You can subscribe to this podcast using your podcast software of choice, or by visiting www.rustyquill.com/subscribe. Please rate and review on iTunes, it really helps us to spread the podcast to new listeners, so share the fear! #0002202 Statement of Vincent Yang regarding his claimed imprisonment by Mikaele Salesa. Original statement given 22nd February 2000. Thank you to this week's patrons: A.L. Hade, Tim Ledsam, Kay, Kandria Sanchez, Rokk, Julie Saunders, Nate Cleveland, Rhys Lawton, Sam Gregge, Ash Pile If you'd also like to support us, head to www.patreon.com/rustyquill Sound effects for this episode provided by previously credited artists via freesound.org. You can subscribe to this podcast using your podcast software of choice, or by visiting www.rustyquill.com/subscribe. Please rate and review on iTunes, it really helps us to spread the podcast to new listeners, so share the fear! If you want to get in touch with us, feel free to tweet us at @therustyquill, drop us an email at mail@rustyquill.com or comment on our dedicated Forums available at rustyquill.com. #0170701 Statement of Tessa Winters, regarding a strange computer program she downloaded from the deep web three months ago. Statement recorded direct from subject, 7th January 2017. Thank you to this week's patrons: Kate Onyett, Nik Crombie, Josh Harper-Cole, Alice Carroll, Lawrence Medina, Doug Warren, Chris, Kirsty Sider, Suki Wan, Aaron Tunney If you'd also like to support us, head to www.patreon.com/rustyquill Sound effects for this episode provided by previously credited artists via freesound.org. You can subscribe to this podcast using your podcast software of choice, or by visiting www.rustyquill.com/subscribe. Please rate and review on iTunes, it really helps us to spread the podcast to new listeners, so share the fear! If you want to get in touch with us, feel free to tweet us at @therustyquill, drop us an email at mail@rustyquill.com or comment on our dedicated Forums available at rustyquill.com. #0152005 Statement of Donna Gwynne, regarding an unlicenced archeological dig near the Red Sea in Egypt. Original statement given May 20th 2015. Thank you to this week's patrons: Jack Burton, Sarah Lykins, Florence, Shayne Legassia, Danielle Sturgeon, David Kilgannon, Rachel Manley, Danielle McCrary, Mark Sutton, Chase T Hopper If you'd also like to support us, head to www.patreon.com/rustyquill Sound effects for this episode provided by previously credited artists via freesound.org. You can subscribe to this podcast using your podcast software of choice, or by visiting www.rustyquill.com/subscribe. Please rate and review on iTunes, it really helps us to spread the podcast to new listeners, so share the fear! If you want to get in touch with us, feel free to tweet us at @therustyquill, drop us an email at mail@rustyquill.com or comment on our dedicated Forums available at rustyquill.com. Case #0143103 Statement of Erin Gallagher-Nelson, regarding an urban exploration trip beneath St Paul’s Church West Hackney. Original statement given March 31st 2014. Thank you to this week's patrons: Deirdre, SJPatterson, Kay Hoddy, Daniele Boucher, Jen Moore, Paul Courtenay, Tyler Shields, Jen Roth, Cathy Sandifer, Jeffrey Lassanske If you'd also like to support us, head to www.patreon.com/rustyquill Sound effects for this episode provided by previously credited artists via freesound.org. You can subscribe to this podcast using your podcast software of choice, or by visiting www.rustyquill.com/subscribe. Please rate and review on iTunes, it really helps us to spread the podcast to new listeners, so share the fear! If you want to get in touch with us, feel free to tweet us at @therustyquill, drop us an email at mail@rustyquill.com or comment on our dedicated Forums available at rustyquill.com. Case #0080307 Statement of Mary Keay, recorded 3rd July 2008. Regarding her first Leitner. Special thanks to Carrie Cohen as the voice of Mary Keay Thank you to this week's patrons: James Gibson, Samantha Emery, Elizabeth, Erin Butler, Dominic Zeal, Paul Browning ,Letizia Yemma, Sarah Mainwaring, Corey Nueman, Tyler Reisinger a.k.a Silphius If you'd also like to support us, head to www.patreon.com/rustyquill Sound effects for this episode provided by youandbiscuitme and previously credited artists via freesound.org. You can subscribe to this podcast using your podcast software of choice, or by visiting www.rustyquill.com/subscribe. Please rate and review on iTunes, it really helps us to spread the podcast to new listeners, so share the fear! If you want to get in touch with us, feel free to tweet us at @therustyquill, drop us an email at mail@rustyquill.com or comment on our dedicated Forums available at rustyquill.com. Case #0160112 Statement of Detective Alice “Daisy” Tonner, regarding the traffic stop of a delivery van on the M6 near Preston on the afternoon of 24th July 2002. Thank you to this week's patrons: Will Blackstock, Stuart McQueen, Kevin Turner, Simon Freeston, Theo Imeson, Bryn, Laura McCarthy, Jennifer Davis, Kate Cheema and Robert Espy If you'd also like to support us, head to www.patreon.com/rustyquill Sound effects for this episode provided by previously credited artists via freesound.org. You can subscribe to this podcast using your podcast software of choice, or by visiting www.rustyquill.com/subscribe. Please rate and review on iTunes, it really helps us to spread the podcast to new listeners, so share the fear! If you want to get in touch with us, feel free to tweet us at @therustyquill, drop us an email at mail@rustyquill.com or comment on our dedicated Forums available at rustyquill.com. Case #9721207 Statement of Rosa Meyer, concerning a persistent feeling of being watched. Original statement given July 12th 1972. Thank you to this week's patrons: Icarus, okpksound, Katrina Salomons, Kat Munn, Jarrod Holmes, Chris Yost, George Stone, Hazel, May and Steven Chlebek If you'd also like to support us, head to www.patreon.com/rustyquill Sound effects for this episode provided by previously credited artists via freesound.org. You can subscribe to this podcast using your podcast software of choice, or by visiting www.rustyquill.com/subscribe. Please rate and review on iTunes, it really helps us to spread the podcast to new listeners, so share the fear! If you want to get in touch with us, feel free to tweet us at @therustyquill, drop us an email at mail@rustyquill.com or comment on our dedicated Forums available at rustyquill.com. Case #0052911 Statement of Ronald Sinclair regarding his years spent in a teenage half way house on Hill Top Road, Oxford. Original statement given November 29th 2005. Thank you to this week's patrons: Jagovanni, Summoboomo, Meredith Clayton, K, Morgan Garratt, Aslee Graves, Calacatia, Tiffany Irving, Rose Lewis and Jeff Stanberry Sean's Kickstarter for Exuviae can be found at http://kck.st/2nCT5y8 If you'd also like to support us, head to www.patreon.com/rustyquill Sound effects for this episode provided by previously credited artists via freesound.org. You can subscribe to this podcast using your podcast software of choice, or by visiting www.rustyquill.com/subscribe. Please rate and review on iTunes, it really helps us to spread the podcast to new listeners, so share the fear! If you want to get in touch with us, feel free to tweet us at @therustyquill, drop us an email at mail@rustyquill.com or comment on our dedicated Forums available at rustyquill.com. Head to patreon.com/rustyquill and you can help to support us from just $1 a month. If you can spare a little more there’s all sorts of bonus content available at the 2, 5 and 10 dollar levels, including early access to ad-free versions of our episodes and bonus material from both The Magnus Archives and The Rusty Quill Gaming Podcast, including character sheets and archive transcripts. It’s taken a lot of money to get things to this stage, and anything you can give will help us to develop the company even more, giving us access to a dedicated recording space, better equipment and the time to create even more podcasts, videos and webcomics. If you want to help out go to patreon.com/rustyquill. We really, really appreciate your enthusiasm and support you’ve all shown us since we started, and we hope to be able to provide you with excellent entertainment for years to come! Case #8450512 Unsigned statement regarding potential cannibalism while attempting to travel the Oregon Trail. Original letter dated December 4th 1845. Sound effects for this episode provided by previously credited artists via freesound.org. You can subscribe to this podcast using your podcast software of choice, or by visiting www.rustyquill.com/subscribe. Please rate and review on iTunes, it really helps us to spread the podcast to new listeners, so share the fear! If you want to get in touch with us, feel free to tweet us at @therustyquill, drop us an email at mail@rustyquill.com or comment on our dedicated Forums available at rustyquill.com. Case #0090404 Statement of Carter Chilcott, regarding their time spent in isolation aboard the Space Station Daedalus in September 2007. Sound effects for this episode provided by YMB, Omar Alvarado and previously credited artists via freesound.org. You can subscribe to this podcast using your podcast software of choice, or by visiting www.rustyquill.com/subscribe. Please rate and review on iTunes, it really helps us to spread the podcast to new listeners, so share the fear! If you want to get in touch with us, feel free to tweet us at @therustyquill, drop us an email at mail@rustyquill.com or comment on our dedicated Forums available at rustyquill.com. Case #0100710-B Continued statement Trevor Herbert, regarding the latter years of his career as a vampire hunter. Original statement given July 10th 2010. ... If you haven’t already, be sure to visit www.RustyQuill.com/subscribe in order to subscribe to us using your podcast software of choice and be sure to leave reviews online. If you want to get in touch with us, feel free to tweet us at @theRustyQuill, drop us an email at mail@RustyQuill.com or comment on our dedicated Forums available at www.rustyquill.com. Case #0160311 Statement of Jordan Kennedy, regarding several encounters while working in pest control. ... If you haven’t already, be sure to visit www.RustyQuill.com/subscribe in order to subscribe to us using your podcast software of choice and be sure to leave reviews online. If you want to get in touch with us, feel free to tweet us at @theRustyQuill, drop us an email at mail@RustyQuill.com or comment on our dedicated Forums available at www.rustyquill.com. Statement of Sampson Kempthrone, regarding the workhouse architecture of George Gilbert Scott. Original statement given June 12th 1841. If you haven’t already, be sure to visit www.RustyQuill.com/subscribe in order to subscribe to us using your podcast software of choice and be sure to leave reviews online. Statement of Gregory Pryor regarding his investigations into one Hector Lerado during the summer of 2007. Today’s episode has been sponsored by Failbetter Games, so be sure to check out Fallen London at www.Failbettergames.com/RustyQuill for free actions! Statement of Andrea Nunis, regarding a series of encounters in the streets of Genoa, Italy Original statement given 25th March, 2010. Statement of Helen Richardson, regarding a new door in a house she was selling. Statement recorded direct from subject 2nd October 2016. SFX this week from FreqMan, MoKoLoKo, Mixedupmoviestuff, paulmessier and previously credited artists via www.freesound.org. Statement of Herbert Knox, regarding a repeat customer to his bookshop in Chichester. Original statement given December 21st 1998. Special thanks again to Ian Hayles for editing assistance with today’s episode. Statement of Thomas Neill, regarding his experiences working in malarial research during the spring of 2010. Original statement given February 9th 2011. Special thanks again to Ian Hayles for editing assitance with today’s episode and everyone who watched the charity live stream we participated in for the mental health charity Mind, you help really made a difference. Yuri Utkin. Incident occurred in the village of Algasovo, central Russia, November 1952. Statement given 2nd March, 1979. Committed to tape 15th April, 1997. Gertrude Robinson Recording. Special thanks again to Ian Hayles for editing assitance with today’s episode. Please do take the time to visit www.twitch.tv/happygoluckyscamps at 9AM GMT on 28th Dec 2016. The 12 hour livestream is for a great cause and any donations people are able to make are welcome, particularly at this time of year. Statement of Police Constable Basira Hussain regarding her time investigating strange occurrences as part of Section 31. Statement taken direct from subject September 19th 2016. Special thanks to Ian Hayles for editing assitance with today’s episode. Statement of Jennifer Ling, regarding a live musical performance she attended in Soho. Original statement given November 3rd 2013. Statement of Jonathan Sims, Head Archivist of the Magnus Institute, regarding exploration of the tunnels recently discovered below the archive. Statement given direct, 2nd September 2016. It would be a great help to us if you are able to visit http://www.audioverseawards.net/site/vote/ and vote for us before ballots close on Wednesday December 7th. Also, remember that in order for your vote to count you must vote in every category not just ours. Season 2 of The Magnus Archives will commence on the 1st December 2016. With Season 1 complete and Season 2 in development, Jonathan Sims and Alexander J Newall take some time to answer your questions. Thank you to everyone who has listened and helped our small operation grow into the cult it has. If you haven’t already be sure to leave a review, check out our forums and spread the word of your favourite Horror podcast. Particularly with Halloween on the way. If you want to help us out and take the time to vote in the Audioverse awards you can do so here: http://www.audioverseawards.net/site/vote/ Be sure to hurry though as time is running out! Special thanks to menacingsibrow, missnash, Coil, Seanfsmith, Kitsune, Spooniermist, Kea, Seelingkat, Atlas Robson, Ghiacciato39, SwordOfBraavos, VorpalisRabbitus and everyone else who has taken the time to send us in questions. Apologies that we couldn’t get round to answering them all. Statement of Elias Buchard, Tim Stoker, Sasha James, Martin Blackwood and Jonathan Sims regarding the infestation of the Magnus Institute by the entity formerly known as Jane Prentiss. And so we arrive at the end of Season 1. Season 2 of The Magnus Archives will commence on Thursday 1st December but before then we will be featuring an interview with Jonathan Sims, writer and voice of the archivist. If you can’t wait that long, Jonathan will also be appearing as a special guest in the Halloween special of our sister program, the Rusty Quill Gaming Podcast, alongside Alexander J Newall and Ben Meredith, the voices of Martin and Elias. Be sure to subscribe at www.rustyquill.com/subscribe or via the podcast app of your choice. Original recording of Jane Prentiss’ attack upon The Magnus Institute, London, 29th July 2016. Next week’s episode is the final in season 1 of the Magnus Archives. Season 2 will be coming after a short break. More details next week. Be sure to subscribe using your podcast software of choice to get every episode automatically downloaded to your device. Visit www.RustyQuill.com/subscribe for quick and easy links. It’s more convenient for you and really helps us out. Statement of Andre Ramao, regarding a series of misplaced objects lost over the course of three month. Original statement given June 6th 2012. This is your last chance to submit a question to writer/narrator Jonathan Sims before we record our Season 1 interview. If you want to do so, get in contact using the details below. Statement of Jason North, regarding the discovery of an alleged ritual site found near Loch Glass in Scotland. As Season 1 draws inexorably towards its close remember, we will be hosting an interview at the end of season one and if you let us know any questions you have for writer/narrator Jonathan Sims or the rest of the team at Rusty Quill we will try to read them on the recording. Statement of Nicole Baxter, regarding visits culminating in the fire that consumed Ivy Meadows Care Home in Woodley, Greater Manchester. As Season 1 draws inexorably closer towards its close remember, any questions you have for writer/narrator Jonathan Sims or the rest of the team at Rusty Quill should be posted to our forums at www.RustyQuill.com. We will be hosting an interview at the end of season one and all the best questions will be read on the recording. Statement of Harold Silvana, regarding discoveries made during the renovation of the Reform Club, Pall Mall. If you have any questions for writer/narrator Jonathan Sims or the rest of the team at Rusty Quill visit our forums at www.RustyQuill.com and post it to the dedicated thread. We will be hosting an interview at the end of season one and all the best questions will be read on the recording! Statement of Dr. Lionel Elliott, regarding a series of events that took place during his class Introduction to Human Anatomy and Physiology, at Kings College, London. Statement of Carlita Sloane, regarding her work on a container ship travelling from Southampton to Porto do Itaqui. Statement of Jane Prentiss, regarding a wasps nest in her attic. Statement of Lawrence Mortimer, regarding his hunting trip to Blue Ridge, Viginia. Statement of David Laylow, regarding his time working at an industrial abattoir near Dalston. Statement of Melanie King, regarding events at the abandoned Cambridge Military Hospital during filming in January 2015. Statement of Paul McKenzie, regarding repeated nocturnal intrusions into his home. Statement of Sasha James, assistant archivist at the Magnus Institute, London, regarding a series of paranormal sightings. If you have any questions for Jonathan Sims or the rest of the team at Rusty Quill visit our forums at www.RustyQuill.com and post it to the dedicated thread. We will be hosting an interview at the end of season one and all the best questions will be read on the recording! Statement of Mark Bilham, regarding events culminating in his visit to Hither Green chapel. Thanks again to everyone who took the time to vote for us in the 2016 Podcast Awards, sadly we didn’t manage to win this year but just getting nominated will be great boost for us. Statement of Leanne Denikin, regarding an antique calliope organ she possessed briefly in August 2004. Thanks again to everyone who took the time to vote for us in the 2016 Podcast Awards, we find out the winners next week. Statement of Albrecht von Closen, regarding a discovered tomb near his estate in the Black Forest. Thanks to everyone who took the time to vote for us in the 2016 Podcast Awards. We were completely overwhelmed by your support and look forward to finding out who won in the coming weeks. Statement of Martin Blackwood, archival assistant at the Magnus Institute, London, regarding a close encounter with something he believes to have once been Jane Prentiss. 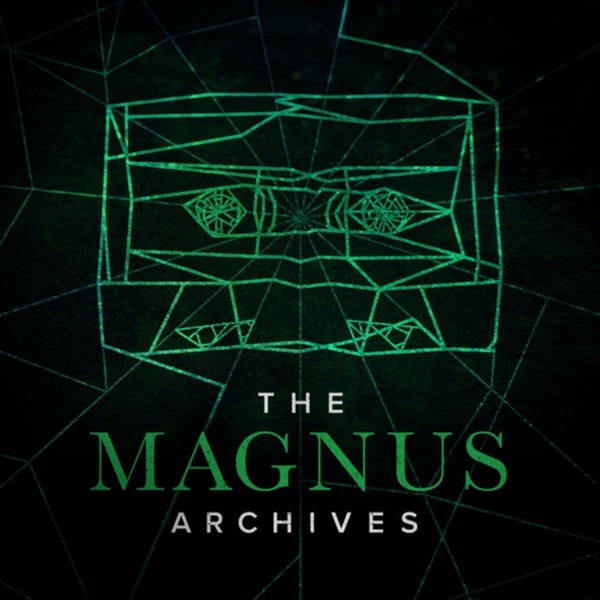 There is still time to vote for The Magnus Archives in the Arts category of the 2016 Podcast Awards! Don’t forget that our other podcast, Rusty Quill Gaming, has also been nominated in the Games and Hobbies category. Daily voting continues until Sunday 12th June and you can vote for each of our podcasts once a day during that period at www.podcastawards.com. Also be sure to verify your vote every day by selecting the option in the email receipt you are sent. Like we keep saying, this voting system allows us to duke it out with companies that are much larger than us so do please take the time to vote every day in the period. If we were to win it would allow us to bring you much more content, sooner and to a higher quality. Statement of Moira Kelly, regarding the disappearance of her son Robert. Continuation of the statement of Father Edwin Burroughs, regarding his claimed demonic possession. We are happy to announce that The Magnus Archives has been nominated in the Arts category of the 2016 Podcast Awards! Even better, our other podcast Rusty Quill Gaming has also been nominated in the Games and Hobbies category! Thanks to everybody who took the time to nominate us. Daily voting starts on Sunday the 29th May and continues until Sunday 12th June. That means you can vote for each of our podcasts once a day during that period at www.podcastawards.com. This system means that a small company like us can still compete if we have fans dedicated enough to take the time to vote every day in that period. So please do take the time to vote repeatedly as it makes a huge difference. We have lots of exciting projects planned for you down the line but we could make so much more if we were to win an award like this. Statement of Father Edwin Burroughs, regarding his claimed demonic possession. Be sure to subscribe using your podcast software of choice to get every episode automatically downloaded to your device. Visit Rustyquill.com/subscribe for quick and easy links. It’s more convenient for you and really helps us out. Statement of Christof Rudenko, regarding his interactions with a first floor resident of Welbeck House, Wandsworth. Statement of Sebastian Adekoya, regarding a new acquisition at Chiswick Library. Thanks to everyone who took the time to nominate us for the People’s Podcast Awards, we really appreciate your support. As our launch draws to a close we will drop down to our normal weekly release schedule from next week with fresh episodes every Thursday at midnight. Statement of Carlos Vittery regarding his Arachnophobia and its manifestations. Statement of Laura Popham, regarding her experience exploring the Three Counties System of caves with her Sister Aleana Sanderson. Featuring Hannah Brankin as Laura Popham. Thanks again for all the support from everyone since we launched. All your reviews and recommendations have really had an impact on our launch. The Magnus Archives is actually registered with the People’s Podcast Awards and they are taking nominations till the end of April. Being nominated would be a huge deal for a small, independent production company like ours so if you take the time to nominate us it would make a massive difference to us. Just head over to www.podcastawards.com and enter The Magnus Archives under the “Arts” category (and “People’s Choice” category if you are feeling generous. You could even enter our other Podcast Rusty Quill Gaming into the “Games and Hobbies” category while you are there. Statement of Lee Rentoul, on the murder of his associate Paul Noriega. Statement of Naomi Herne, regarding the events following the funeral of her fiancé, Evan Lukas. Today’s episode features guest star Katie Davison. Statement of Lesere Saraki, regarding a recent night-shift at St. Thomas Hospital, London . Thanks again for everyone who has taken the time to subscribe and leave us a review. We have been enjoying our time on the front page of iTunes. And for anyone who hasn’t yet, please do take the time. We are a small, independent company and these recommendations are the best way to help us out. Statement of Antonio Blake , regarding his recent dreams about Gertrude Robinson, previous Head Archivist of the Magnus Institute. Statement of Trevor Herbert, regarding his life as a self-proclaimed vampire hunter. Statement of Julia Montork regarding the actions and motivations of her father the serial killer Robert Montork. Be sure to subscribe using your podcast software of choice to get every episode automatically downloaded to your device. It’s more convenient for you and really helps us out. Even better, leave us a review. The more reviews we get, the more people listen and the more we can make! Tweet us at @theRustyQuill, drop us an email at mail@RustyQuill.com or comment on our dedicated Forums available at www.RustyQuill.com. For more information visit RustyQuill,com. Statement of Evo Lensik regarding his experiences during the construction of a house on hilltop road Oxford. Remember that during these launch weeks we need as many reviews and subscriptions as possible in order to get the attention we need to climb up the podcast charts. Every time you recommend our work you help us make more! Statement of Staff Sgt. Clarence Berry regarding his time serving with Wilfred Owen in the great war. For everyone who has already left a review, thank you! As an independent production company we cant afford big adverts so your review is absolutely critical to our continued success. Be sure to subscribe using your podcast software of choice to get every episode automatically downloaded to your device. It’s more convenient for you and really helps us out. Statement of Timothy Hodge regarding his sexual encounter with Harriet Lee and her subsequent death. For more information visit RustyQuill.com. Statement Of Keiran Woodward regarding items recovered from the refuse of 93 Lancaster Rd. Walthamstowe. Statement of Dominic Swain regarding a book briefly in his possession in the winter of 2012. If you intend to leave a review but haven’t already please do so! We are an independent production company without a major marketing budget so these reviews are the main way people come to find our work. Statement of Amy Patel, regarding the alleged disappearance of her acquaintance Graham Folger. Statement of Joshua Gellespie regarding his time in the possession of an apparently empty wooden casket. Statement of Nathan Watts, regarding an encounter on Old Fishmarket Close, Edinburgh . Join Head Archivist Jonathan Sims as he begins his work transcribing the archives of the Magnus Institute. An organisation dedicated to the investigation of the esoteric and weird. Be sure to subscribe to us on your podcast software of choice to get every episode automatically downloaded straight to your device. It’s more convenient for you and really helps us out. Even better, leave us a review! The more we get the more programming we can make! The Magnus Archives are… OPEN. New episodes every Thursday produced by Rusty Quill, featuring guest actors, short stories, serial plots and more. Be sure to subscribe to us on your podcast software of choice to get every episode automatically downloaded straight to your device. It’s more convenient for you and really helps us out. Like what you’re hearing? Let us know! Here is the pre-launch trailer for The Magnus Archives, wherein our new Archivist makes his first attempt to record a transcript. The Magnus Archives is a weekly horror fiction podcast examining what lurks in the archives of the Magnus Institute, an organisation dedicated to researching the esoteric and the weird. Join the new head archivist Jonathan Sims every Thursday as he explores the much-neglected collection of statements and investigations, digitising them and converting them to audio along with supplementary investigations by his team. New episodes every Thursday featuring guest actors, short stories, serial plots and more. The Magnus Archives is an original program produced by Rusty Quill and is written and narrated by Jonathan Sims. Available from iTunes and all good podcast providers. The Magnus Archives is a weekly horror fiction podcast released every Thursday featuring guest actors, short stories, serial plots and more.